Chalk one up for Sony: After a year of Xbox exclusivity, Netflix has finally announced that it will be coming to the PlayStation 3 in November. Talk that Netflix wanted to expand its online video rental service beyond the Xbox 360 has been floating since early this year and in September, CEO Reed Hastings said he wanted to get the service on "all the game consoles." While there's been no indication that a move to the Wii is imminent, PlayStation 3 owners are finally going to get a piece of the pie. Netflix will initially be available on the PS3 by way of a free, streaming Blu-ray disc that uses BD-Live to activate the Netflix interface on the system. Users will insert the disc into their console to see a list of "thousands" of movies and television episodes organized into a variety of categories based on personal preferences, new arrivals and more. According to Gizmodo, the disc will be required every time Netflix is used, "at least until the next major system update." The new Netflix service for the PlayStation 3 is expected to begin streaming in November and will be available at no extra cost, aside from the standard $8.99 monthly fee, to U.S.-based PS3 owners. 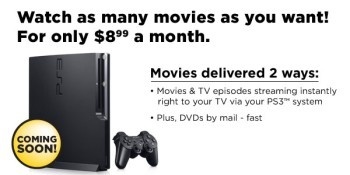 To learn more and sign up for your own PlayStation 3 Netflix Blu-ray disc, head over to www.netflix.com/ps3. Source: PlayStation Blog, thanks to Nilcypher for the tip.